I was born and bred in Devon, England. I am obsessed with the world of pastry and desserts. These two facts combine, as you can probably imagine, into a girl with quite a few opinions and stories about scones and cream teas. 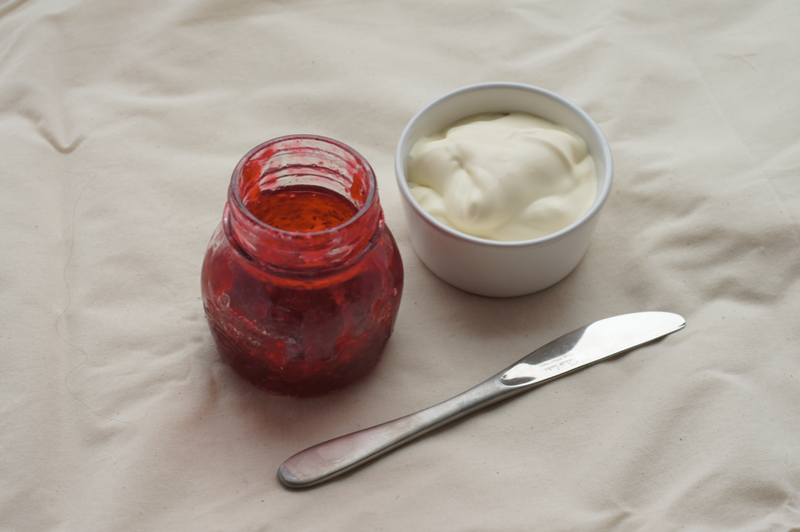 To start at the most obvious point of contention: cream before jam or jam before cream. If you are versed in the ways of cream teas, you might have already guessed my affiliation from my birthplace. 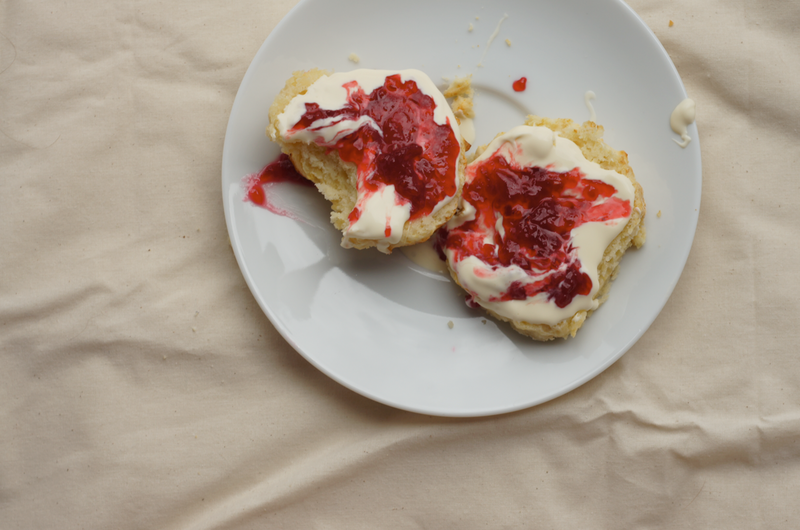 I believe in scone-cream-jam. Though, I have to admit, I don't entirely know why. It's a bit like Cambridge as an Oxford student - you can't quite figure out why you're not supposed to like them, but you find yourself part of the rivalry anyway. And so I prefer the Devon cream tea. I just do. I have to point out that I do still enjoy a cream tea that doesn't fit everything I say below. I'm also not so opposed to jam-cream to judge people for their preferences. Except my mum, who goes scone-butter-jam-cream, which is just weird. Given all this love for scones and cream teas, you might think I have been crafting this recipe since I was a toddler, or that it's a family recipe. We have been making scones all my life, but this is the first time I've had the obsession to get a good recipe with them. I made scones five days in a row for tea (yes, we do have afternoon tea every single day at our house. It's a meal just like lunch. When else do you think we eat all these baked goods?! ), had a little breather for a day, then finally made them again yesterday. Day One: Nigella's Lily's Scones, straight up. Day Two: Lily's Scones plus creme fraiche. Day Three: raspberri cupcakes' CWA Scones, straight up. Day Four: Day Three plus creme fraiche and formed into a taller block. Day Five: Day Four plus a different method of combining ingredients. Day Six: a glass of water and a carrot stick. Day Seven: Day Five plus a higher temperature. 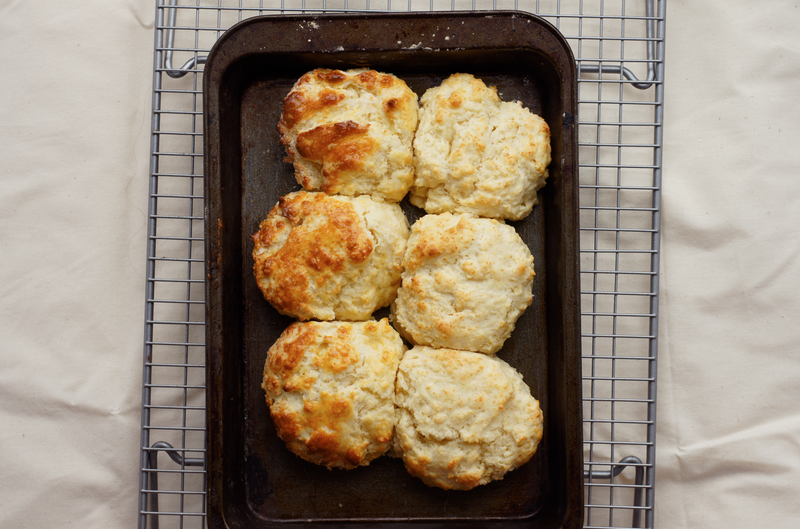 A good scone should be lightly browned with a crispy crust and a light, fluffy interior. I like using the creme fraiche because it gives the scones a little tang. Not having butter in the recipe makes it faster and easier too. You can either wash these with milk or egg depending on how brown you'd like them. You can see this on the batch above, where the ones on the left are egg washed and the others are milk washed. In Oxford, I ate a lot of cream teas. I never found the perfect one. The Vault off Radcliffe Square came closest. The Old Parsonage came next. The main problem with most cream teas is that they focus on the scone or even the tea and forget the rest (though you do get awful scones too). The quality of the cream and jam is paramount, as is the quantity. A thimble of mediocre clotted cream for two scones does not make a good cream tea. You need plenty of good quality clotted cream (not too much crust, and it shouldn't be grainy at all) with some good jam, preferably raspberry or strawberry. 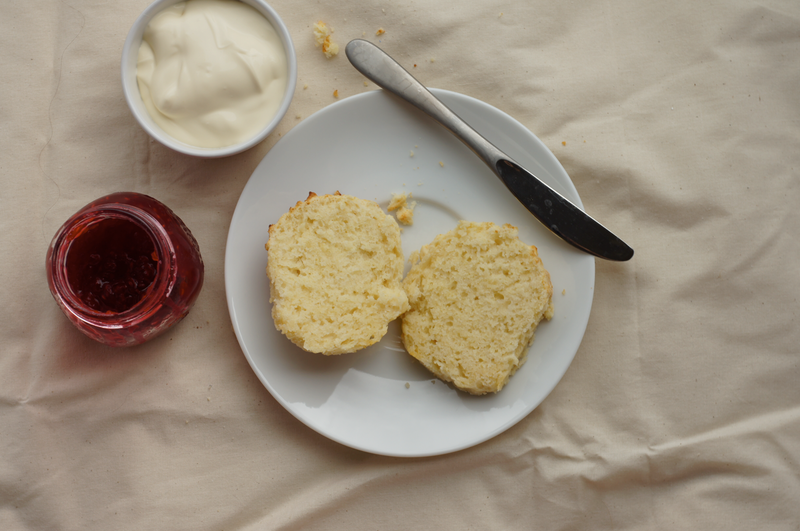 Don't be shy with the cream - it's what gives the scone its moisture and luxuriance. I like homemade raspberry jam. A cream tea isn't particularly sweet: the scones don't have any sugar, the cream should be unadulterated and hopefully the jam won't be too sugary either. I know a lot of people can't get good quality clotted cream outside of Devon and Cornwall and particularly outside the UK. Mum can't get it here in Switzerland. Recently we tried making it using a method she had used as a child with the unpasturised milk we get from the local laiterie. We tried a couple of times with different methods but it never really worked. Then about a week ago I was working on a catering job and discovered the cream they were serving with the meringues and summer fruits. It's Gruyere double cream, which we had been buying in the supermarkets for years, but from the Chaumerie in the centre of town. This version is seriously thick. And guess what - it tastes exactly like clotted cream without the crust! BINGO. It's great for scones, though the latest pot we bought wasn't quite as thick as the last, so it looks a tiny bit runny in these photos. I realise this still doesn't help most of you. I reckon that the best substitute might be marscarpone beaten with a little bit of double cream if you can't find clotted or a super super thick cream. Also, fun fact: I believe the very first photograph I took of food when I was 13 was of a scone loaded with cream and jam. I tried to find it for you but sadly I think it's in England. To me, a good cream tea is one of life's ultimate pleasures. 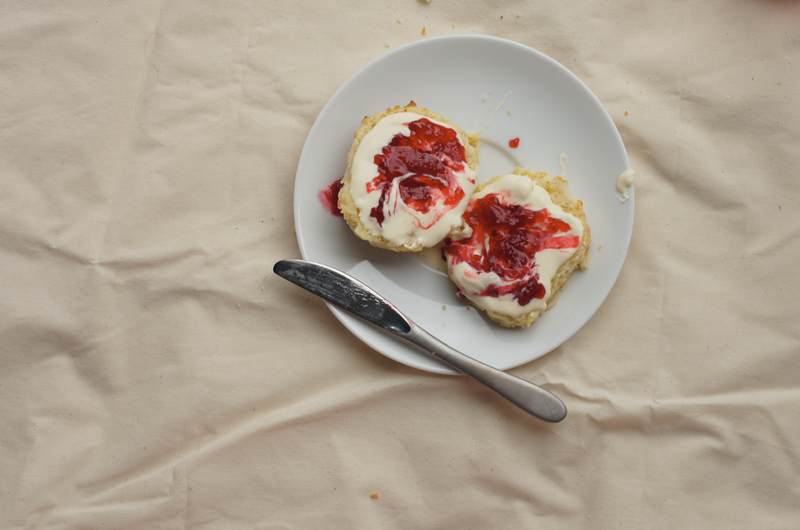 It's all about the slight crisp from the crust, the fluffy scone with a sour note, the cool, thickly luxurious cream and the contrasting bright tones of the raspberry jam. Perfection. Preheat the oven to 230C. Lightly grease a small baking tray. Sieve the flour, baking powder and salt into a medium mixing bowl. Place the double cream and creme fraiche into a small bowl and whisk together. Pour the cream mixture into the flour bowl and fold in very gently with a metal spoon, being careful not to overwork. When it is incorporated, add the milk in three portions, carefully folding between each. You don't need the dough to be uniform - just a sticky mess. Dust your work surface with flour then tip the dough out onto it. Dust your hands with flour then quickly and lightly form the dough into a square about 3-4cm tall. Press down on a floured 6cm fluted biscuit cutter to stamp a scone out of the dough. Place onto the greased tray. You should get four scones out of the original square - place them close to each other on the tray, almost touching. Roll the remaining scraps of dough into two circles gently and with floured hands press lightly into the cutter (I find this causes less overworking than re-rolling). Place onto the tray. Brush the tops of the scones with a pastry brush with either a little extra milk or an egg yolk. Place into the oven and bake for 13-15 minutes until risen and golden. Serve while still warm. On another note, your Mum eats scones with butter AND cream? How incredibly decadent! thelittleloaf - hehe well I don't think I could ever be sick at the sight of scones! Though the break day was needed. And yes, she does. She also used to eat her crunchy nut corn flakes with whole milk and double cream drizzled on top. I have absolutely no idea how she is so skinny. Yumm those are beautiful pictures! And hooray for the new blog design Emma! Not going to lie, I did a little happy dance when I saw you were trying out my CWA recipe! I will definitely have to try your variation, it looks perfect. Totally understand/applaud your determination to get just the right recipe :) I've heard so much about that Gruyere double cream, I'm salivating at the mouth just looking at these photos! You also made me realise there are things I do to my scones that I forgot to mention on the post, like the milk wash on top. The egg wash on yours gave it such a great colour, will have to try that next time! yum! I adore scones! Yesterday my boyfriend and I drove to a bakery on the Sunshine Coast (one and a half hours north of Brisbane), just because I wanted their INCREDIBLE scones. We got date scones and a pumpkin one for trying and boy, did they light up my whole day! I love scones, they are so simple, but decadent and special at the same time. My Mum makes the best scones, and despite a lot of testing I can't reproduce the same result. I love your idea of incorporating creme fraiche, I will have to try that. I love your dedication to finding the right scone recipe, and I love that it was a CWA recipe that you chose to share. My Nana would be proud!! Love love love scones! Great fluffy scones, that is! And I'm with you - lots of cream and homemade jam. However, I am scone, jam, cream sort of girl. mmmmmm! 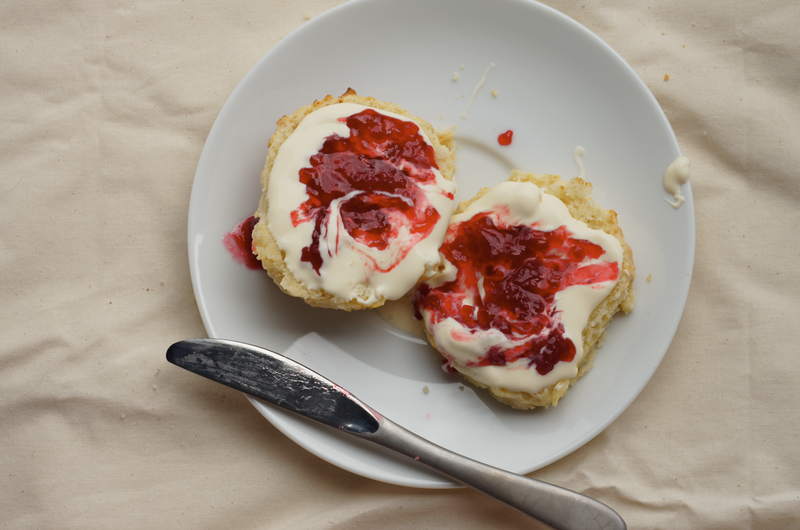 Love how much importance you have given to scones- jam before or after cream, type of cream. Looks like scones are a serious business in your home. Have a ball at Food Blogger Connect and stay safe in London. Oh.....and take lots of notes for me!! I share your scone obsession myself. I'm a South-West girl (Gloucestershire) married to a Devon-born and bred boy (and my daughter was born in Devon too). Living in the Middle East makes traditional English things even more tempting and I'm currently doing a pretty good tour of England via cream teas. Clotted cream without any sweetener is a must. Homemade jam perfect. Scones are such a lovely thing to make and eat but must be eaten on the day they are baked. 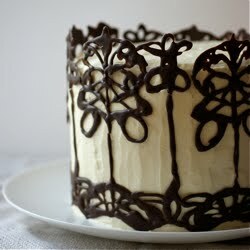 Beautiful pics as always - I'm very impressed by your research and your habit of afternoon tea. Stephcookie - It's an awesome recipe & your love of it made it a must-try :) Is that from David Lebovitz? I remember him posting about it a while ago. I did wonder if you brushed with milk or something else to get those nice brown tops. So pleased you approve of my reinvention! girlleastlikely - date and pumpkin scones sound super exotic! I think I need to try some fruit scones soon. Glad you enjoyed the post! Sukaina - well they are important! A national dish of sorts. And so delicious. As I said on twitter, when you're next in London I'll made you some :) I'll definitely take some notes for you, I'm very sad not to be meeting you - but another time! mycustardpie.com - scone obsessions are definitely the way to go. I totally agree that they must be eaten on the day - really within an hour. I can imagine being in Dubai does make English stuff seem more tempting and precious - even here while still in Europe I find that. Thanks for your kind words. This is fabulous! I have made a few scone recipes over the years but have always looked for something that felt more authentic and less like a muffin (a crime often committed by Starbucks and other bakeries here in the US). I think these might be our Saturday breakfast this weekend. I am an absolute scone devotee. There is nothing like a good cream tea to set life right again. Madison Mayberry - I've always been interested in what US 'English Muffins' were. Are they like adapted scones? I hope you enjoy them if you make them! Amy - Cream teas do make life seem better, don't they! I hadn't thought of gluten free scones, how interesting. Glad to know that spelt scones are just as good. I love how quick they are to make - such a short time from 'I need a scone' to them being on the table. Nuts about food - hehe well I'm off to London today so perhaps you'd be better off on the flight! Cindy - ooh really? That's interesting - I know people make savoury scones with cheese but I hadn't thought of what you'd eat them with (can you tell my brain works in sweet mode not savoury?!). These scones look absolutely gorgeous! 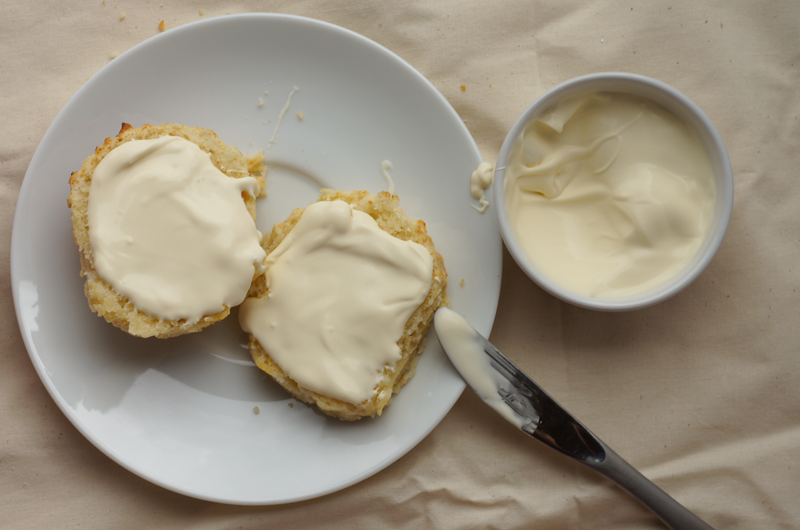 I like the idea of using marscapone as a stand-in for clotted cream too, with some vanilla, sugar and lavander folded through it it would be divine! kerrycooks - marscarpone is the closest thing I can think of. I've never cooked much with lavender, sounds like a nice idea. So gorgeous! I love tea and scones, and raspberry jam really is the best one, isn't it? Too bad I didn't get any made this year. What's even worse is that clotted cream and even double cream are not available in Canada. I will be looking for that Earl Grey blossom tea, as I'm an Earl Grey girl too. Mary - how do you cope without double cream?!?! My mum would implode without access to double cream. Do see if you can find the tea, it's gorgeous. You inspired me to make some fruit scones - well, scones with raisins to be precise. As a fellow Earl Grey aficionado, I added a lovely twist to the scones by soaking the raisins in some freshly brewed Earl Grey tea! The oh-so clever use of the tea (did I mention I'm modest?) added a very delicate citrus hint to the scones and resulted in ever so moist fruit therein. Spiffingly good! I love the idea of soaking the fruit in tea! I bet they were delicious. Have you tried the cream tea at Waterstones, in London? Those were the best scones I have ever tasted! Plus, they come with a very generous serving of jam and clotted cream. (and a lovely view over the London rooftops). No, I haven't - thanks for the tip! I hope you enjoy them if you do try them.